University of Hawai’i Press, 2000. Modern Okinawa has been forged by a history of conquest and occupation by mainland Japan and the United States. 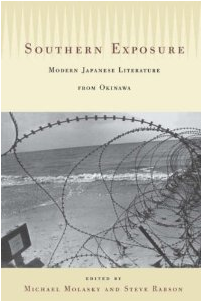 Its sense of dual subjugation and the propensity of its writers to confront their own complicity with Japanese militarism imbues Okinawa’s literary tradition with insightful perspectives on a wide range of issues, including the ongoing discrimination against ethnic minorities in both Japan and the United States and the conflicting desires for Okinawa’s assimilation to, and autonomy from, mainland Japan. Okinawa’s literary tradition is as deeply rooted in the region’s lush semi-tropical landscape as it is in history. The writers in Southern Exposure paint scenes of the natural world that simultaneously depict beauty, horror, and depredation. Okinawans’ quest to recover their ancient cultural heritage is haunted by war, occupation, and other forces that are noticeably absent from the mainstream literature of contemporary Japan, all of which are addressed in Southern Exposure. Michael Molasky is professor of Japanese at Connecticut College in New London. Steve Rabson is professor of Japanese at Brown University. This entry was posted in Japan, Okinawa. Bookmark the permalink.